This will be a new section that briefly explains the terms I use in the review. Gorengan: It’s like deep fried wonton/dumpling without the meat. 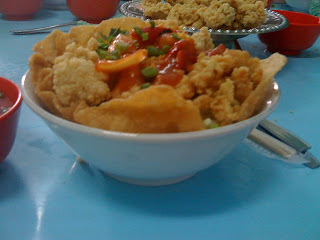 Udang Rambutan: Deep-fried prawn balls that are shaped like Rambutan fruit. If you look at the price range, there was no typo there. That’s just how ‘affordable’ (if you don’t want to say cheap) food can be in Indonesia. As a general rule, when we go food hunting in Indonesia, it’s the taste that matters. 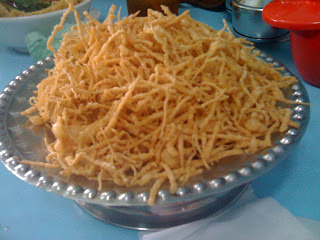 Hot Cui Mie presents us with a unique bowl of noodles. 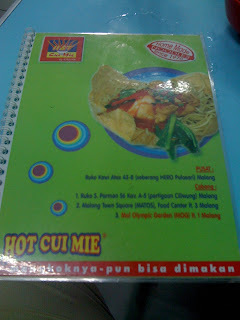 Their signature dish is Hot Cui Mie Ayam Jamur(Chicken and Mushroom). 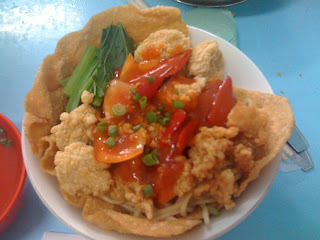 The bowl was coated with gorengan and the noodles is served with deep fried chicken and mushroom with spicy sauce (and some veggies, of course). For those of you who don’t like it spicy, they also provide us with the No Hot version. We ordered Kulit Ayam and Udang Rambutan for starters. Both starters came with sweet and sour dipping sauce for extra taste. 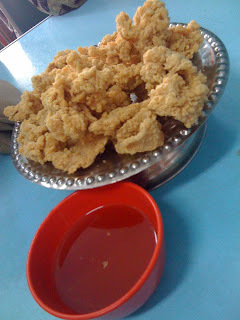 Kulit ayam were deep fried to a point where it still retains the softness of chicken skin, yet it’s crispy on the outside. It also filled us up incredibly quickly before the main arrived. Udang Rambutan wasn’t well presented. It looked like a plate full of crackers. You had to dig into the crackers to actually get the prawn ball. Their prawn ball was also filled with quail egg. For the drink, I would suggest you to order Iced Mocha. However this is not the regular mocha coffee that you’ll find in coffee shops across Australia. 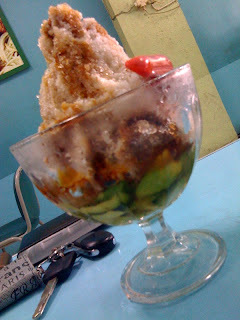 Instead, you will get slices of avocado in shaved ice with chocolate milk. I like this drink a lot since it is refreshingly sweet. There was the big mud flood incident near the city of Porong years ago that causes the trip from Surabaya to Malang doubles. The government built natural barrier to isolate the mud. ‘Lumpur Lapindo’, as the locals said it, can still be seen on your way to Malang. Surabaya citizens normally go to Malang or Tretes for a quick weekend getaway since it has cooler temperature than the scorching hot city life.